Retrieve a relic of the original Dawnguard. "I've been pouring [sic] over some of the tomes left here in the keep." Dawnguard Rune Hammer: "A powerful warhammer imbued with magic that places warding runes on the ground to obliterate it's [sic] wielder's foes." Dawnguard Rune Shield: "A magical shield that when blocked with, surrounds it's [sic] wielder with a holy aura that harms the undead." 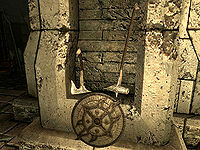 Dawnguard Rune Axe: "An axe imbued with magic fueled by the destruction of the unholy. With every victorious blow against an undead creature, its power grows." For each version of this quest you will be told to go to a random dungeon from the table below, where you'll find the artifact in the boss chest. When you return each artifact to Florentius, he will allow you to keep it: "Well done! I said you'd return victorious, Arkay wasn't so sure. Wield it bravely." 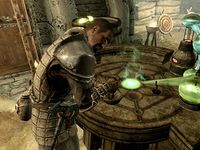 If you ask Florentius how you can help before finishing a certain number of Gunmar's and Sorine's side quests, he will only say that Gunmar or Sorine are looking for some assistance. But once you've done enough quests for Gunmar, Gunmar will say talk to Florentius. 10 Florentius Baenius has sent me to retrieve the <Alias=Item> from <Alias=Dungeon>. 255 Finishes quest I have retrieved the <Alias=Item> from <Alias=Dungeon>. On the PC, it is possible to use the console to advance through the quest by entering setstage DLC1RH08 stage, where stage is the number of the stage you wish to complete. It is not possible to un-complete (i.e. go back) quest stages, but it is possible to clear all stages of the quest using resetquest DLC1RH08. Esta página foi modificada pela última vez à(s) 12h26min de 17 de outubro de 2014.